Another election is drawing near and Nigerians will have to determine her future for the next four years. Over the years, we have clamoured for a change in the status quo of bad leadership and 4 years ago we though we actually got it right… what went wrong? As it is, the politicians and decision makers do not limit their vision around the 4 year-election circle like an average Nigerian does and if we can understand this, then a genuine and lasting change can definitely happen for Nigerians. That means our vote must go to posterity, it must go to passion, it must go to believe and to a servant who is ready to pay the price of sacrifice. The kind of Nigeria we want may not happen overnight but if we vote for vision today, then the leader coming in knows his work is just a phase in the long-term project of the making of a new Nigeria which must be passionate, deliberate and sustainable. Therefore, it is not about who we think can occupy the office, it is a deliberate assessment of who embodies the qualities of a sustainable work for the actualization of the new Nigeria. The much talked about Presidential held on Saturday, January 19, 2019, at the Transcorp Hilton Hotel, Abuja. It was organised by the Broadcasting Organisation of Nigeria, in partnership with Nigerian Election Debate Group and some other bodies. Out of five presidential candidates of five political parties that were scheduled to participate in the debate, only three took to the podium, as the presidential candidates of the ruling All Progressives Congress, President Muhammadu Buhari; and that of the Peoples Democratic Party, Atiku Abubakar, stayed off the event for various reasons later adduced by them. We too will like to go with the submission of the analysts. For many years, 2 political parties – APC and PDP – have been at the helm of power presenting influential candidates backed by the resources of the powerful parties. Somewhere along the line, the aim of the election has been blurred and it has become a power tussle between the 2 parties. How else do you explain the absence of one candidate being the reason why another left the venue? 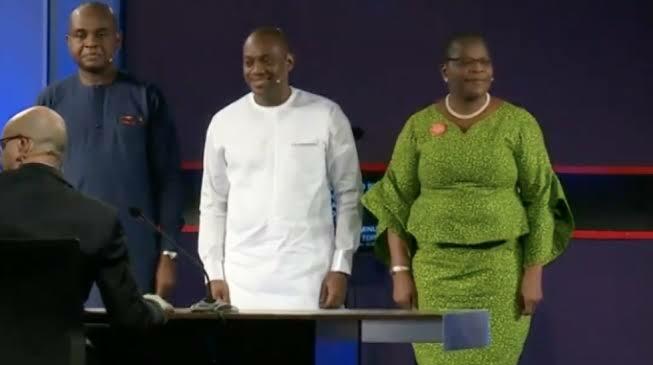 It was a debate to give Nigerians a reason why we think a candidate is fit to occupy the office of the president and when the chips were down, the two most influential parties’ candidates had a reason why they could not be part of the debate. These candidates travel far for political campaign making various promises and claims but when it was time to back their promises and claim with the first simple assignment – they could not turn up! It was like a student not showing up for a mock exam! This only tells us something as a nation. It’s time to change the status quo. Let’s change the narratives and follow vision, passion and sustainable development over promises, crowd mentality. It is time we put the nation first before our pocket and stomach. If we want a leader that can sacrifice, then we have to be willing to pay the sacrifice it will take to get t]such leader in power! Also, alliance as opposed to competition can also provide a strong backing for the new parties if the status quo will change. Instead of having A, B, C who are fit for the job under different political parties and competing against each other, why not come together under one umbrella, put resources together and push out one candidate? That way, maybe we will be able to challenge the power and influence of the 2 almost indomitable parties.